Well, that's a slight exaggeration. We've been informed that several spectators and, as it turns out, a few members of the Braves and Yankees didn't hit home runs today in New York. Still, quite a few dingers pierced the sizzling afternoon air — nine, to be exact, which is a record in this young Yankee Stadium. Atlanta, in particular, got to slugging against Phil Hughes. Hughes, who, as Joe discussed earlier, has been much better of late, just got drubbed by the Braves' bats. Hughes's fastballs must've looked like beach balls to Atlanta hitters, as he gave up four homers and six earned runs overall before leaving in the middle of the fifth inning. 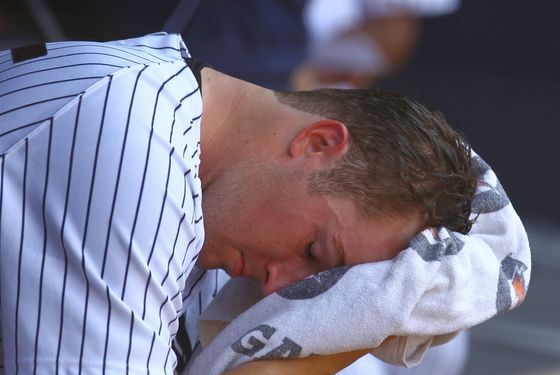 The Yankees did plenty of swatting themselves, just not enough. New York was down 6-1 when Eric Chavez, Alex Rodriguez, and Robinson Cano each homered, and Curtis Granderson hit a single with men on to cut it to 6-5. They could've come all the way back, too, if it weren't for those recurring struggles with runners in scoring position. Jayson Nix's deeeep fly ball in the fifth with Russell Martin on base got unceremoniously robbed by Michael Bourn, and Rodriguez later ground into an inning-ending double play when the Yanks were on the comeback trail, down 6-5 with two men on in the seventh. They've really made an art of screwing up RISP situations (and, conversely, of slugging with no one on base). It didn't help, either, that the Yankees got some uncharacteristic struggles from the non–Clay Rapada members of the bull pen, nor that Chavez bungled a double-play ball in the eighth that Mark Teixeira totally would have handled. New York was done scoring at that point, anyway, so perhaps none of it mattered. The Yankees now have a day off before they take their losing streak — losing streak! — to Citi Field for another exciting weekend series versus the Mets.